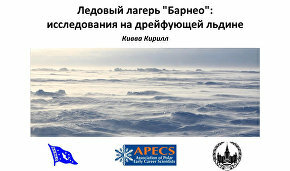 On April 23, Arctic.ru held its first webinar on Arctic research. This online event was devoted to the unique ice camp Barneo, which opens every year in April as a month-long research and tourist Arctic center. Kirill Kivva, a researcher at the Laboratory of Climatic Bases of Bioproductivity of the Russian Federal Research Institute for Fishery and Oceanography (VNIRO) and a member of the 2014 Barneo expedition, talks about the camp’s operation. Kirill Kivva: Today I'd like to tell you about the Barneo Ice Camp, the research projects held there and the procedure and reasons for this research. My name is Kirill Kivva. I am an oceanographer from Moscow who took part in two expeditions to the Barneo Ice Camp in 2014 and 2015. Let's begin. The Arctic Ocean is a large part of the World Oceans located in the Northern Hemisphere. Here is its approximate boundary. Since it is an ocean, it is also a major base of various resources, including biological resources such as fish, and also hydrocarbons and other mineral resources, as well as transportation resources. The Arctic Ocean is also the habitat of many marine animals, from unicellular algae to higher animals, and the habitat of indigenous peoples who live along the entire coast. Also, it's a relatively energetically active zone and the climatic «kitchen» of the Northern Hemisphere. Therefore, the studies of this region and the processes in the ocean, and in the atmosphere above it, are so important for understanding global climate processes. You can see on this map, or drawing, the southernmost extent of the winter sea ice in 2016. The red line marks the average extent from 1980 to 2011. As you can see, the ice limit is considerably further north than the average in the previous period. In fact, it is lower than ever in the entire period of satellite observations due to climate change. This is the reason we need to know what exactly is happening. We see a feedback loop, and frankly, people don't know yet and cannot forecast future changes. The Barneo Ice Camp is located somewhere in the vicinity of this red dot. It's a distant part of the Arctic Ocean that's covered by a massive ice sheet. It's very difficult to conduct research there. It's a scientific blank space on the map of the World Ocean, one of those places that's very difficult to get to. You can use icebreakers, but icebreakers and their operation are expensive, so we have to use other opportunities like this drifting ice camp. In addition, the ocean keeps changing, and there are seasonal changes — with the situation in summer differing from what we see in winter. Spring is a very important period in the life of the ocean as a system. Icebreakers can't reach this point between winter and spring, when the Barneo Ice Camp operates, because the ice is very thick and icebreakers are expensive. Icebreakers go there only in the summer usually. So Barneo is an extremely useful place for carrying out research. Now let me give you some scientific data. Why do we study the Arctic Ocean? If an icebreaker sails this route and measurements are taken, we'll be able to compile a picture of the water mass distribution in the Arctic Ocean. This graph is in English, but I'll translate it for you. The ocean water mass is divided into layers, and each layer has its own density, which explains the sequence of the layers. There are different water masses in the Arctic Ocean. Some of them derived from the Atlantic, like this layer here, or this one that's called the Atlantic halocline waters. Halocline is a layer with a strong salinity gradient. The Pacific waters that drift from the Bering Sea are lighter than Atlantic waters and are hence located above them. The Barneo Ice Camp is located above the Lomonosov Ridge just about the area where the Pacific halocline waters meet the Atlantic halocline water. This means that this area is good for studying the process of the Pacific masses distribution, a process that is important for understanding the climatic system of the Northern Hemisphere. The following is a complex graph that shows water masses coming from different sources, and their distribution. You can see many question marks in this graph, which mean that researchers are not yet sure how exactly thosewaters circulate and how variable their pathways are. Our particular research mostly focuses on the distribution of Pacific water masses. Well, let me start at the beginning and tell you briefly about Barneo. 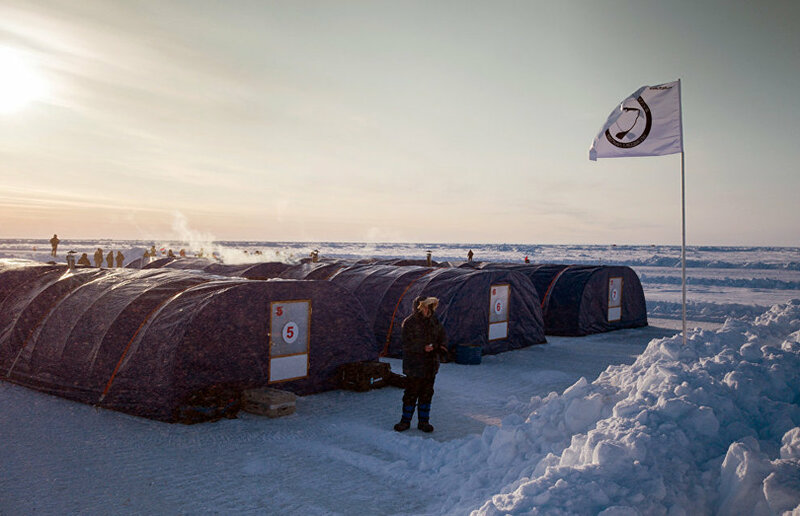 The Barneo Ice Camp is opened every year on a drifting ice floe by the Russian Geographical Society's Expedition Center. In fact, the organizers of this expedition have no federal funds at their disposal. In other words, this is a private project aimed at promoting Arctic tourism. The idea dates back to the 1990s. The first tourist flights to the North Pole or near it were made in 2000. Tourists use Barneo for different purposes. Some do extreme tourism, going on hikes that take several days. Others do less extreme tourism like taking helicopter rides to the North Pole. Still others dive under the ice or do sky diving. It's all about tourism. The scientific part of the Barneo Ice Camp was first established in 2006 and has opened every year since. It is organized by researchers from the Institute of Oceanology at the Russian Academy of Sciences, the State Oceanographic Institute, and the Arctic and Antarctic Research Institute. I'd like to say a few words about the step-by-step establishment of the Barneo Ice Camp. First, helicopter crews locate a suitable ice-floe that could support the camp and a runway. Fuel is para-dropped en route, so a helicopter's range can be extended. It usually takes a few days to find a good ice-floe. After that, the base's personnel, essential equipment and technology, tents, fuel and food are airlifted to the ice-floe. Then they start preparing a runway. I'll show you a slide of that later. After the runway is done, An-74 planes, the largest that can land there, start flying regularly from Spitsbergen (Svalbard), which has the closest civil airport. They perform several technical flights first and deliver additional equipment and personnel to the ice-floe. The tourists and scientists come only after the camp is completely ready. Arguably, it's very hard to establish a runway because the Arctic, especially the near-pole area, are pretty harsh. This work can be very unrewarding. This slide shows how base personnel remove hummocks or ridges of ice with the tractors which are delivered from the mainland. Planes can land when the runway is complete. This year, as well as in the past, cracks cut across the runway, and we they had to start over. Now we'll talk about how research projects are conducted at the Barneo base. As an oceanographer, I'll mostly discuss ocean research. We have to drill an ice-hole to access the water. The ice-floe is about two meters thick, and it's a bit challenging to punch a hole through it. It takes one day and several men. A research tent is then installed over the ice-hole, and a heater and a winch are placed inside the tent. This slide shows the winch. In 2014, we had a electric winch. We take some samples. We plunge this sample collector to various depths, and we can scoop up water samples from under the ice. We do this as deep as 300 meters, and we can go well beyond that. Last year, we had a manual winch, and the researchers took turns rotating the crank for several hours at a time so we could drop some heavy devices deep below. Apart from these tent-based works, one can conduct research using buoys. These automated, long-lasting systems have their advantages. They sample the ocean and can function even after the scientists have left. The photos on the left show how they are installed. And the picture on the right show how this profiler operates. This automated device will continue to work even after the scientists have left, and it relays data to the continent via satellite. Apart from the depths of the ocean water, we also study the ice. This is how ice-core samples are taken. This is an ice core. Ice cores are eventually cut up using special clean tools and devices. Divers' equipment can also be used for taking samples, including biological samples. After the samples are taken, we start processing them on ice or preserve them for processing on the continent, including at laboratories in Moscow. Here you can see me at work, and this is a heavy-duty oceanographic probe. This is my colleague Ivan Gangnus at work. This is the chief scientist Sergei Pisarev. And this is the equipment… Sometimes they are both habitation and laboratory tents. I'd like to dwell briefly on the process for obtaining and presenting our results. The drawing shows the so-called stations or locations where we have taken samples from multiple horizons of the ocean. During one day we obtain samples at 20 horizons. Working from ice-floes presents a challenge because we are unable to control ice-drift direction which depends on the wind. But we, nevertheless, managed to conduct some research in this area. In 2015, people were there for about four months, and we were able to accomplish a lot. As a result, we can build the cutaway sections that I showed in the beginning. This is how we visualize research data. For example, these peak curves denoting heightened amounts of dissolved silica tell us that Pacific Ocean waters might have been located in these areas along the section. By the way, the depths are quite impressive. Add to this oxygen, dissolved mineral phosphorus and some other chemical indicators of seawater. These are important for understanding the production of phytoplankton under the ice and its development. As you may know, phytoplankton is at the bottom of the entire marine food chain. My brief story ends here. I hope it was interesting. I'd like to thank my colleagues, chief scientist Sergei Pisarev and the expedition members on this slide. I'll be happy to answer your questions. Kirill Kivva answered webinar participants' questions after the presentation. Question: The Barneo Ice Camp is at a point of confluence of various water sources. How can scientists tell which waters they're researching? Kirill Kivva: Through our measurements. We can measure the ocean's physical characteristics, mainly water temperature and salinity. As I mentioned, the parameters are based on depth, as the different layers are waters of various origin. We also take chemical samples: so, based on the parameters we measure in them, we can determine if the water is from the Pacific or the Atlantic Oceans. Question: The final slide shows that women take part in the expeditions despite the fact that the conditions in the Arctic and Antarctic can be severe. Do women deal with it okay? Do female researchers take part in expeditions? It's necessary to make ice-holes, put up tents, use winches and heavy equipment — there is some hard physical activity for researchers themselves, so women are rarely involved in the expeditions, but there are exceptions. It depends on our scientific goals. Honestly, many women aren't willing to go into such conditions. Sometimes it's difficult to resolve the issues of personal hygiene. Everything is frozen, the conditions are quite minimal. Question: How is water supplied? Kirill Kivva: Drinking water is supplied to Barneo from Spitsbergen. But the multiyear ice, including sea ice, is non-saline so it's suitable for melting. Snow can also be melted. You can brush your teeth or cook tea or soup, but washing requires a lot of melted water. Last year, the North Pole 2015 station had a bathhouse, but this is only possible on long-term expeditions. Barneo operates for several weeks, while tourists only come for a few days, so there are no comfortable conditions. Question: How do North Pole 2015 and Barneo compare? Kirill Kivva: It's an interesting question, but it is difficult to answer. First, Barneo is a tourist camp, while the North Pole has always been a research station. It's usually located in a different place and is set up from icebreakers. People live and work there for almost a year. North Pole 2015 is worth mentioning as it was the first seasonal drifting camp project. It used the Barneo base; the organizers of the camp did a great deal themselves. In fact, it was quite a different undertaking. Question: This year, two Saudi Arabians were the first to dive during Barneo 2016. Have any unusual records been set in your camp? Kirill Kivva: Honestly, I don't know. Probably they had. For example, in 2014 the Russian Airborne Forces took part in landing drills in the polar area for the first time. A figure skater went to the North Pole by helicopter. A small ice rink was prepared for her, and she did some figure skating movements. I didn't see this myself, but it's on the internet. People try to set new records every year. Last year, a group of small helicopters went there. Some professional travellers use the base as a starting point for their records. Question: Many tourists visit the camp. Do they assist the researchers at all? Kirill Kivva: Honestly, no. They even bother us sometimes. No one expects any help from them because it might make things more difficult. At the Barneo Ice Camp, a maximum amount of work must be carried out in the shortest possible time, so we don't involve them. Question: All right. How is waste removed from the camp? Kirill Kivva: There are a number of ways to do that. First, garbage is taken to the Svalbard archipelago on a regular basis. Second, litter can be burned. Some litter is left on the ice. I showed you some discarded bulldozers that were left there. They're there because it's difficult to take them back. Yes, they fall into the ocean and pollute it in a way, but it's primarily steel that falls to the bottom. 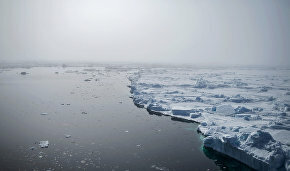 Question: North Pole research plays an important part in understanding climate change. Do only Russian researchers work at the Barneo Ice Camp or do they exchange data with their foreign colleagues? Kirill Kivva: Yes, actually I forgot to mention this. The automated systems, the buoys that I showed, are mainly of US or French origin. They are usually installed by US or French experts. This is done on a commercial basis, so they use our base. The Norwegians and maybe other researchers do too. They carry out a wide range of well-planned research projects. The data from the buoy stations are available on the internet (regarding the data exchange question). But some information is not posted immediately, as research groups have to publish it, after which it's available to scientists. Question: Researchers also need to study ice, the atmosphere or space in addition to the ocean waters. What kind of research is carried out at the Barneo Ice Camp? Kirill Kivva: As long as I know, the Barneo Ice Camp is used for oceanological and ice research mostly. I showed you how ice cores are extracted to study the chemical and biological composition, as there are always unicellular organisms in the lower ice layer. I haven't heard of space research, but I might be unaware of it. Atmospheric research is usually done at more "long-term" stations, such as the North Pole station. I'm not a meteorologist, so it's difficult to speak on the issue, but I believe that many atmospheric characteristics can be measured from planes or satellites, so the academic community might be less interested in this data. Besides, it's difficult to organize this because aerological sounders are launched using heavy gas tanks, and it's difficult to deliver them to this base. Question: A question regarding life at the ice camp: what is prohibited at the camp? Are there animals there? Kirill Kivva: Yes, there are. For example, dogs for tourist dog sleds are delivered by plane. No one is willing to take their pets to the pole, but it is possible if required, I believe. You can't bring anything that's considered illegal anywhere else, for example, on Spitsbergen. Actually, the camp always has weapons to be used in case polar bears approach. This can be dangerous. Certainly, there are medical supplies. Question: Are any special safety drills held at the camp? Kirill Kivva: There are instructions, not drills. Drills are held on Spitsbergen and they take a couple of days. Here, tourists and researchers receive instructions. Head researchers are responsible for safety. 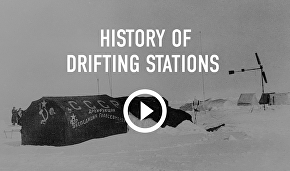 In our case, this was Sergei Pisarev, who has worked on drifting ice for over 20 years, which is a lot of experience. He has dealt with various situations. The ice could crack just at the camp site at night or during the day, and this requires urgent action. In this case, everyone stops working and moves the equipment, tents and food. But in general, staying at the Barneo Ice Camp is quite safe. Moderator: Our online meeting has come to an end on that positive note. If you have any questions, you can send them after the video is posted. Kirill, thank you very much. On April 23, Arctic.ru held its first webinar on Arctic research. This online event was devoted to the unique ice camp Barneo, which opens every year in April as a month-long research and tourist Arctic center.